Apps rely on access to your Twitter and Facebook data to work. Of course you need to authorize them, but it’s a one time deal, and often forgotten. A lot of apps rely on access to your Twitter and Facebook data to work. Of course you need to authorize them to access it, but it’s a one time deal, and often forgotten. When was the last time you went through that list of apps? I went through my Twitter and Facebook profiles yesterday and realized there are a bunch of apps that I no longer use, and they no longer need access to my profile data. 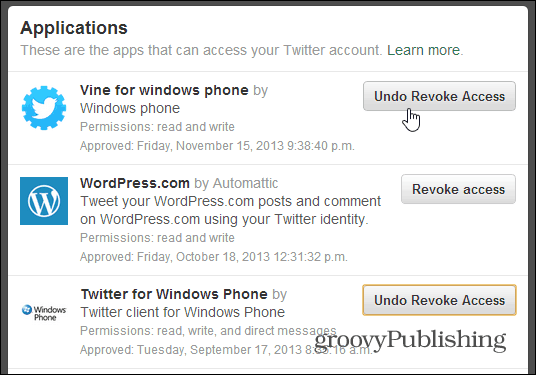 Here’s a look at how you can remove app access on these two popular social networks. Sign in to your Twitter profile if you’re not already, then click the gear icon on the upper right of your profile and select Settings. 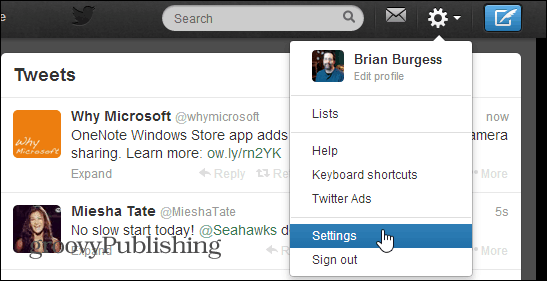 Then select Apps from the list in the left pane. 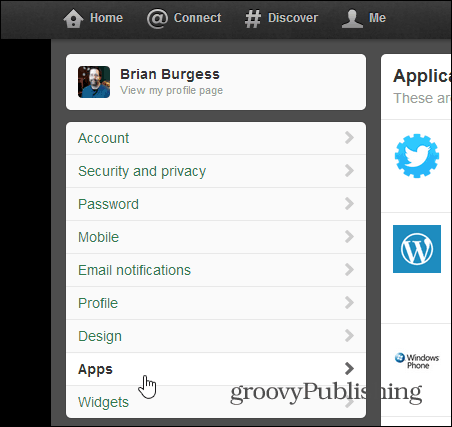 Now on the right you’ll see a list of the apps that can access your Twitter account. If you’ve never done this before you’ll be surprised of the number of apps you’ve granted access to over the years. 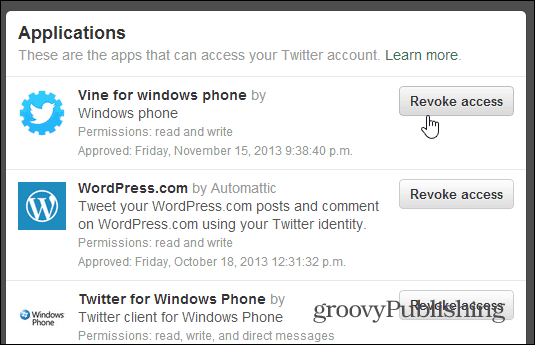 Go through the list and simply click the Revoke Access button. If you change your mind about an app, you can Undo Revoke Access, but this will only be an option while you’re on the Apps screen. 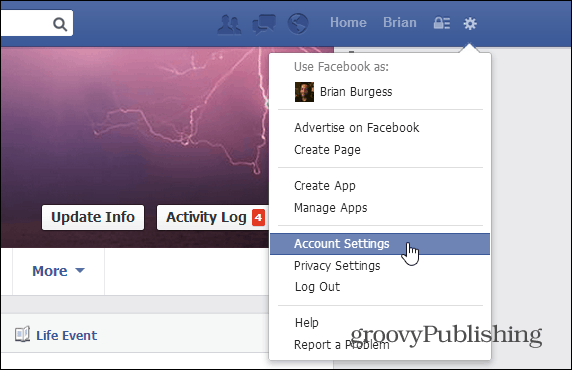 Removing app access in Facebook requires a few more steps, but if you know where to go, it’s easy. 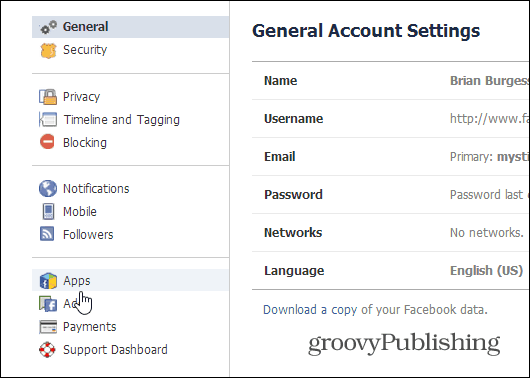 Click the gear icon in the upper right corner and select Account Settings. Next on the General Account Settings page, select Apps from the left panel. A list of apps that you’ve granted access to your profile over the years. Facebook gives you a bit more control over these apps. Click Edit to see what the app needs, its visibility, what it can do and more. At the bottom, in the Legal section, you can remove it. Or simply click the “X” next to the Edit button. 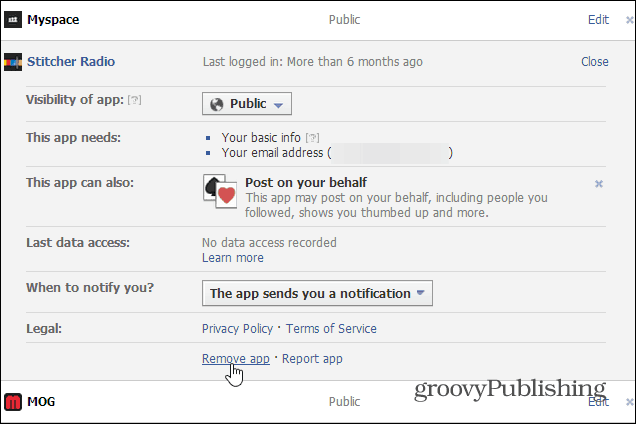 Then verify you want to remove it, and you can delete all of the activity you’ve had on Facebook with the app. If you’re a heavy Facebook user, chances are that you’ll have a lot of apps accessing your profile. So make sure to click the link at the bottom of the page to show all apps.